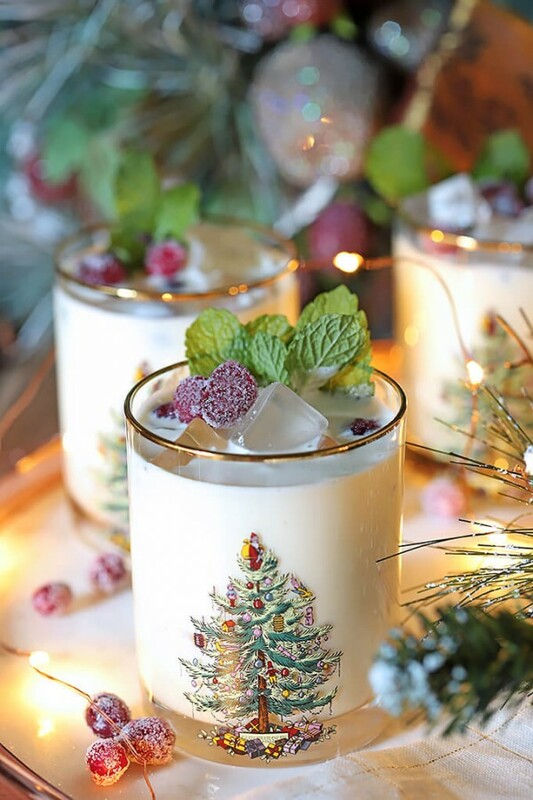 For a really unique glass of holiday cheer, you have to try this White Chocolate Mint Eggnog Cocktail; it’s rich and creamy with a subtle touch of mint. 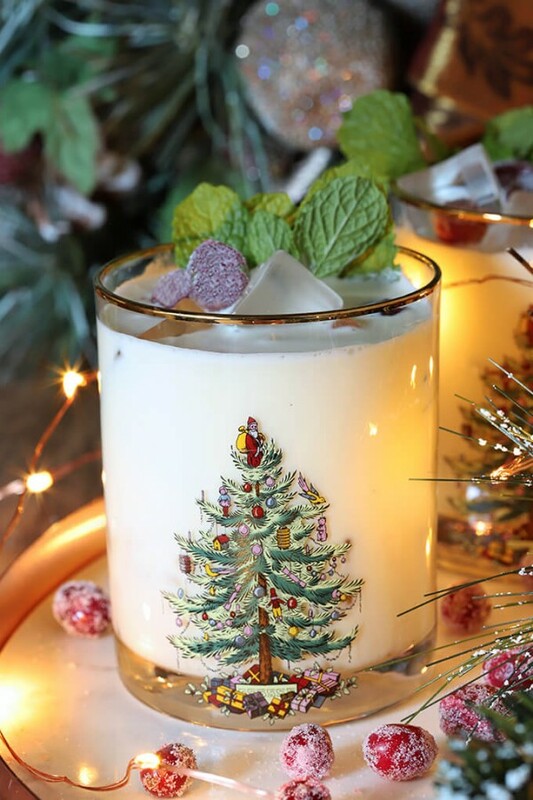 I love making a new eggnog cocktail for the holidays but this year I was a bit stumped; I’ve added a lot of the usual suspects; rum, kahlua, espresso, and more. So honestly? I took my inspiration from these new glasses I bought last week. I love these glasses; they’re the traditional Spode Christmas Tree design that’s been around forever so when I saw some at HomeGoods I did the deed; even if I have enough glasses already to outfit a small bar! Plus I knew that any current version on display today would look exactly the same and cost three times as much; at least that was my excuse for purchasing four of them. Still, they needed the perfect cocktail and I knew that darling tree would look best with eggnog in it but nothing was coming to me. Until one of those middle of the night moments, when you can’t sleep but solve the world’s problems or in this case my cocktail problem…why not white chocolate with some fresh mint? I’ve seen something similar with peppermint but it’s never been my jam, I wanted the aroma of spearmint, not peppermint; for me there is a huge difference. I’ve garnished the cocktail with mint leaves and sugared cranberries but in truth, I had the cranberries ready for a dessert I’m making and thought they would be pretty so you don’t HAVE to make them. Although they are so good and a bit addictive! If you decide to forge ahead, the recipe is on this page for a Red Wine Chocolate Cake with Sugared Cranberries. I melted my white chocolate in some of the eggnog and then added fresh mint leaves to the warm mix and let it steep for a few minutes before mixing the strained white chocolate and mint mixture with the rest of the eggnog and vodka; a quick blend to get it frothy and into the fridge it went to get nice and cold. I’m having my annual holiday party tonight and it is taking everything I’ve got to not take another sip, or ten. This is a real winner; definitely eggnog but with the white chocolate and mint it’s elevated to something else. Need a mocktail too? Make the mixture and just add vodka as you prepare each cocktail; leaving it out for those wishing to have a non-alcoholic beverage; either way it’s absolutely intoxicating! Sugared Cranberries are totally optional! Pour one cup of eggnog into a medium saucepan and add the white chocolate chips. Heat to just simmer and stir until the chips are all melted. Turn off the heat. 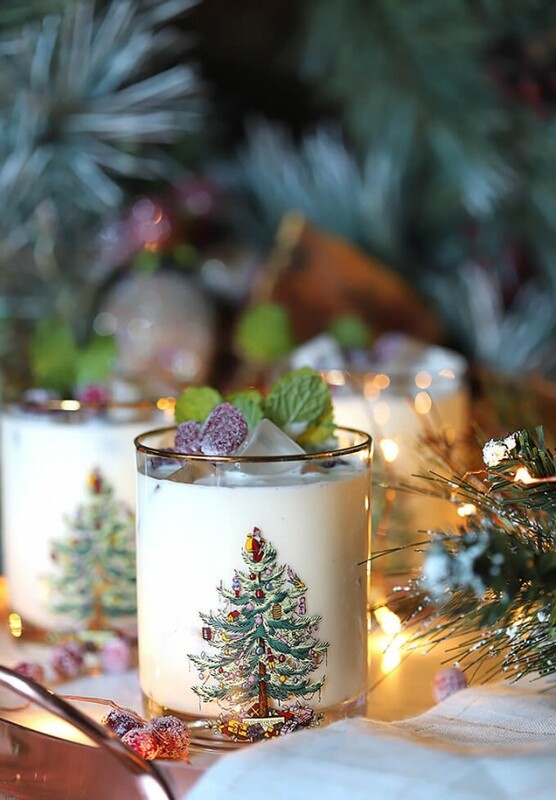 Add the mint leaves to the eggnog mixture and let steep for 15 minutes; strain the mixture into a measuring cup with a pour spout. Pour the remaining eggnog into a blender. Turn blender on low and run while adding the white chocolate eggnog mixture. Scrape the white chocolate from the measuring cup if necessary; it will want to harden once it starts to cool off. Blend on high for just a minute; this is to thoroughly incorporate the white chocolate into all of the eggnog mixture. Pour into ice filled glasses and garnish with a mint sprig. About those sugared cranberries; I honestly already had them ready for something else and thought they would be pretty but they are not absolutely necessary for this drink. 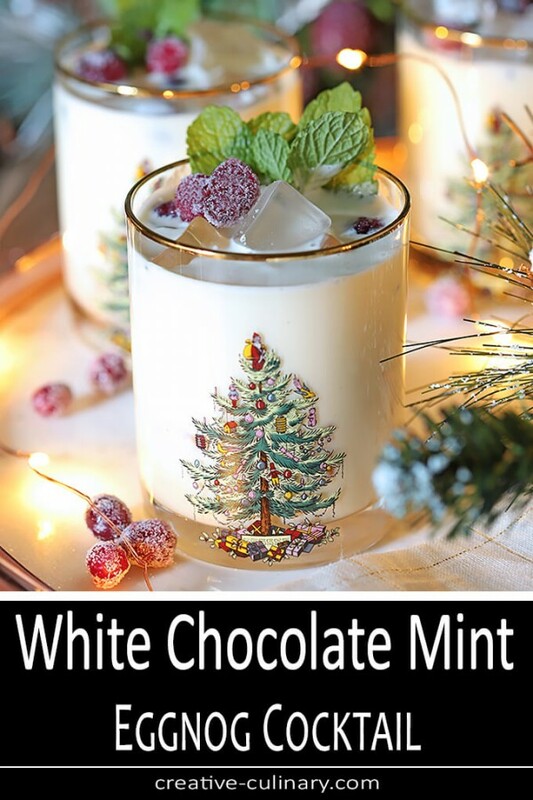 The post White Chocolate Mint Eggnog Cocktail appeared first on Creative Culinary.